Monday: Rain to showers. Highs in the 50s. Overnight Monday: Chance shower, patchy fog. Lows in the 40s. 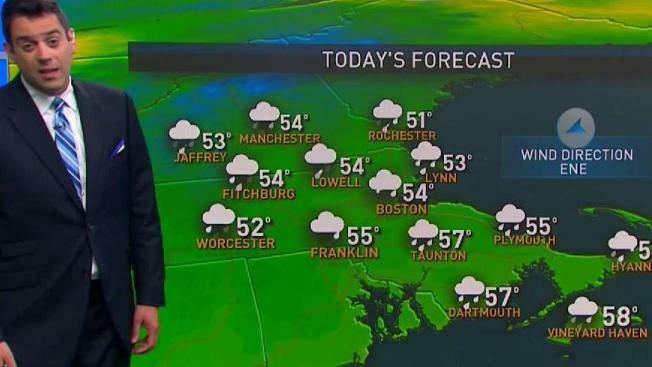 Tuesday: Clouds, peeks of sun, a few showers. Highs in the 60s. Today is the start of an unsettled stretch of weather which will continue into Wednesday. Expect steady rain for much of the day. Some of the rain may be locally heavy at times. It will also be breezy with an onshore flow. Winds may gust to 40 mph along the coast. Temperatures will stay in the mid-50s, which is about 20 degrees below average for this time of year. Tuesday and Wednesday look unsettled as well. Rain will continue on and off through Wednesday afternoon or evening. One to two inches of rain is possible over that 72 hour stretch of time. Skies will clear during the day on Thursday. The week should end with seasonably mild temperatures and some sunshine. Next weekend looks pretty nice. Some rain is possible late on Sunday, but both days should feature some sunshine and temperatures in the mid-70s. Seventy-degree temperatures will stick around through day 10 of the forecast period. Most of the days will be dry, but a shower is possible that Monday morning and again on Wednesday.